If you're thinking about a trip to Grand Teton National Park, you probably have a few questions. When to go? What to see and do? Lodging options? 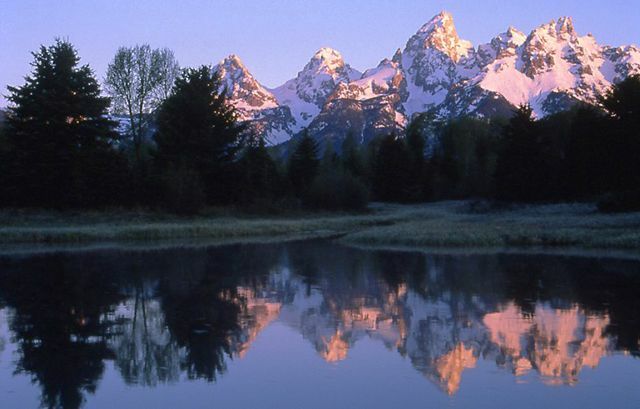 Here are some answers to help kick start your Grand Teton National Park travel planning. With warm weather and mostly-clear skies, July and August offer peak conditions for your park visit (although there can be afternoon thunderstorms). July and August are also the most popular months to visit, and tend to be quite crowded. June and September, with mild days but chilly nights, are fine times to visit. Most park roads and facilities are closed during the winter, but some areas remain open for snowshoeing and cross-country skiing during the day. Parking can be difficult at popular park locations. A nice alternative to consider, whether you are staying inside the park or in Jackson, is the Alltrans Shuttle, which stops at six different park locations, running on 2-3 hour intervals throughout the day. One ticket fee allows you to make use of the shuttle all day. There are three major entrances to the park. Entrance fees are charged per vehicle or per person and are good for both Grand Teton and Yellowstone National Parks. Additional permits are required for backcountry hiking, climbing, boating, and other special uses. The popular months for visiting Grand Teton National Park are also time for road construction. Weather, wildfire, and wildlife activity can cause closures. It's always a good idea to find out about these things in advance so that you can adjust your plans accordingly. Take in the scenery, of course! Whether you do it on a strenuous hike to a famous viewpoint, while floating on a lake or river, or while cruising in your car, the gorgeous scenery is the focus of most activities in the park. Antelope, bison, moose, and bears call this magnificent landscape home and will be a part of your park experience. Grand Teton National Park has several interesting visitor centers and historic sites to visit as well. You have several options for overnight accommodations when visiting this national park. Basing your stay inside the park gives you 24/7 access to mountain views and outdoor activities. The cabins, cottages, and hotels inside the park range from simple and rustic to full-service resort facilities. Tent and RV camping and cabins are available inside the park as well as in nearby Bridger-Teton and Targhee National Forests. Jackson Hole ski resort villages provide additional lodging options. If you plan to visit both Grand Teton and Yellowstone, one of the lodges in the southern part of Yellowstone would be a good base. You're never far from visitor services like shops, food, or service stations when driving through this Wyoming national park. A complex of visitor services is located at Moose Junction and at Colter Bay. Others are scattered along Teton Park Road, primarily near lodgings. Gas is available at Moose and near Jackson Lake Lodge. The communities of Moose Junction and Moran each have a post office facility. Casual restaurants and snacks are available at Leek's Marina, Colter Bay, and Moose. Sit-down dining can be found at Jenny Lake, Signal Mountain Lodge, Jackson Lake Lodge, and Colter Bay. Basic groceries, snack items, camping and recreation gear, and sundries can be found in stores at Moose, South Jenny Lake, and Colter Bay. Shops that sell books, maps, souvenirs, and gift items are located at Grand Teton visitor centers and at Moose, South Jenny Lake, Jenny Lake Lodge, Jackson Lake Lodge, Signal Mountain Lodge, and Colter Bay. Showers, laundry machines, lounges, and boat marinas are among Grand Teton National Park's other visitor facilities. Dogs are allowed in the park but must be restrained at all times. They are not allowed on hiking trails, on the multi-use pathway, in the lake, or in visitor centers. Jackson Hole Airport is the closest airport for park visitors. Flights into this airport include regularly scheduled service, to and from either Denver or Salt Lake City, on Delta Airlines, United Airlines, and Frontier Airlines.